96 cm of textual and other materials. The Kinsmen Club of St. Albert was chartered May 4, 1964 with Michael Page elected Charter President. The initial formation was under the guidance of the sponsoring Edmonton Kinsmen Club. It chartered with a total of 33 members. Service and fundraising projects include the minor hockey club, Kincinema, Tot-Lot playground equipment, fundraising for cystic fibrosis, Blood Donor Clinic, Skate-a-thon, Peanut Nite. Built Kinsmen/RCMP Centennial Centre in Lacombe Park, KinEx Arena in Akinsdale, Kinsmen Korral Sports Park and Rodeo Grounds. Established Kin national project: Shining Light Child Abuse Prevention Program. St. Albert Kinsmen also have two auxiliary clubs: St. Albert Kinette Club (chartered in 1967) and St. Albert K40 Club. St. Albert Kinsmen Club were responsible for chartering the Fort Saskatchewan Kinsmen (1969) and Morinville Kinsmen Club. The Kinsmen took on the sponsorship of a Rodeo in the spring of 1965 in conjunction with St. Albert's 104th anniversary and to raise funds for service projects. 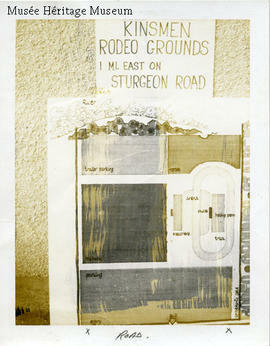 The first three rodeos were rained out leading to the name Rainmaker Rodeo. Original order and arrangement of files maintained. Related collections items can be found in the collections database, 2012.10.